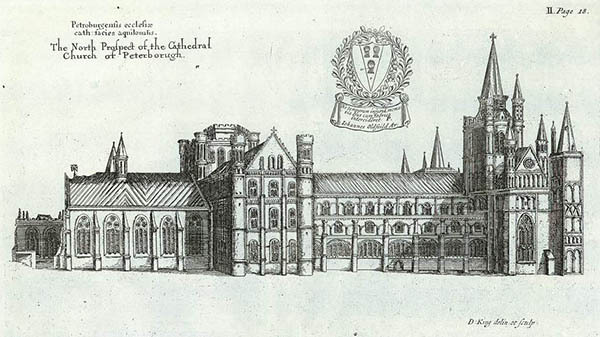 Rebuilt in its present form between 1118 and 1238. 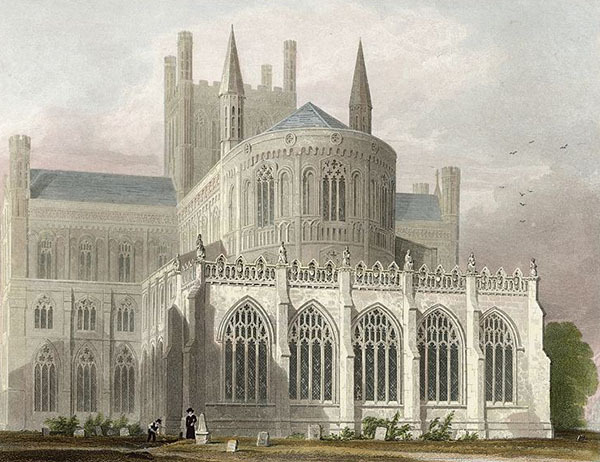 It became the Cathedral of the new Diocese of Peterborough in 1541 and it is now known as the Cathedral Church of St Peter, St Paul and St Andrew. 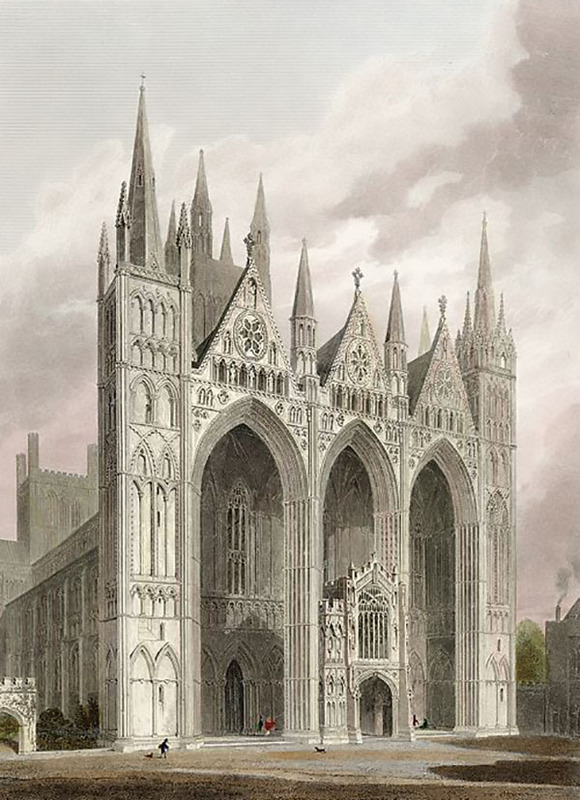 Peterborough Cathedral is known for its imposing Early English Gothic West Front which, with its three enormous arches, is without architectural precedent and is unrivalled in medieval architecture. 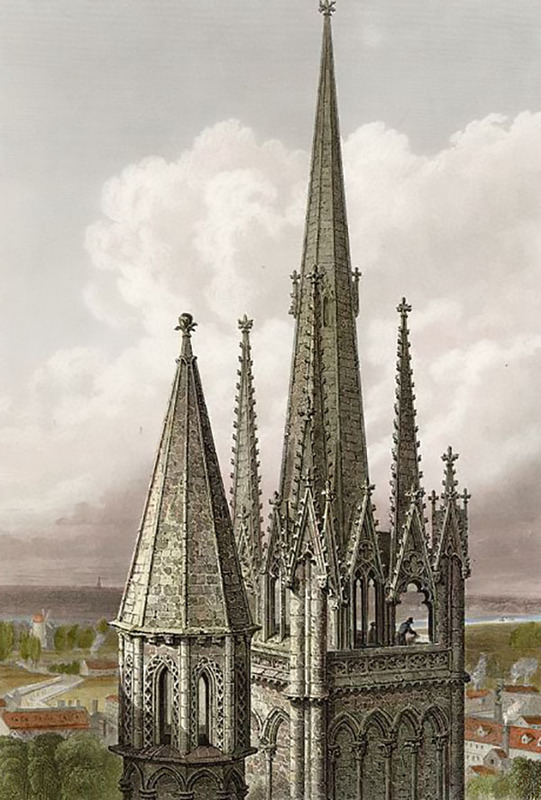 The appearance is slightly asymmetrical, as one of the two towers that rise from behind the façade was never completed. By 1193 the building was completed to the western end of the Nave, including the central tower and the decorated wooden ceiling of the nave. The ceiling, completed between 1230 and 1250, still survives. It is unique in Britain and one of only four such ceilings in the whole of Europe. 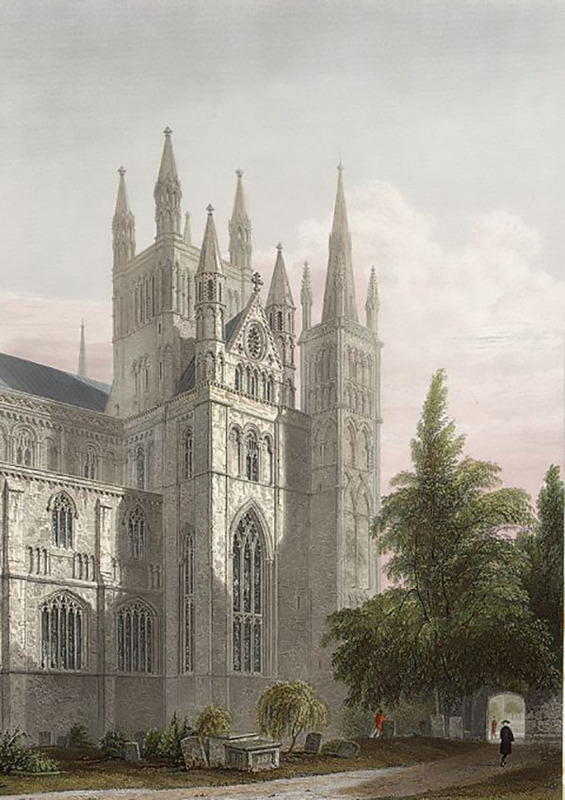 After completing the Western transept and adding the Great West Front Portico in 1237, the medieval masons switched over to the new Gothic style. 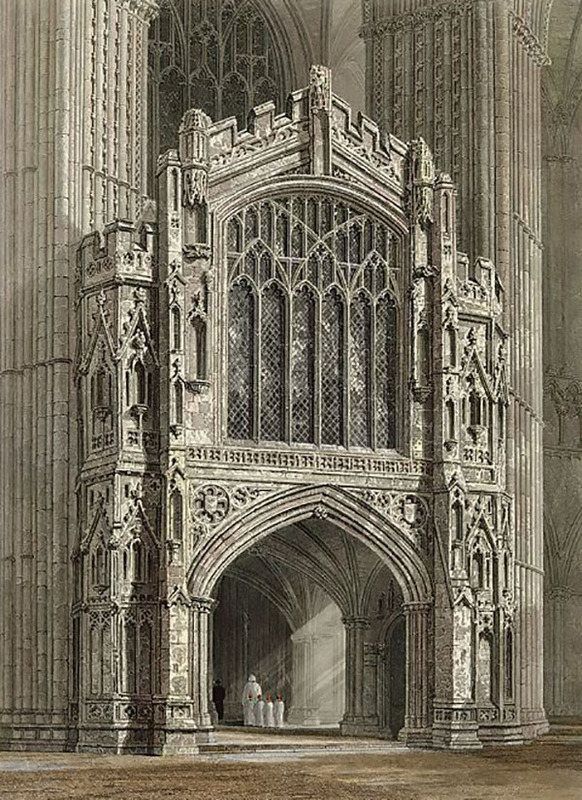 The Norman tower was rebuilt in the Decorated Gothic style in about 1350–1380 with two tiers of Romanesque windows combined into a single set of Gothic windows, with the turreted cap and pinnacles removed and replaced by battlements. 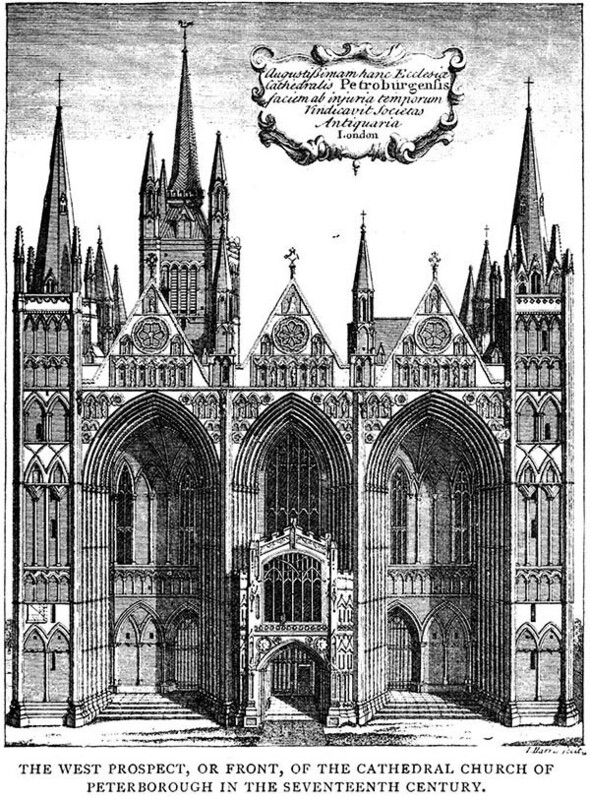 Apart from changes to the windows, the insertion of a porch to support the free-standing pillars of the portico and the addition of a ‘new’ building at the east end around the beginning of the 16th century, the structure of the building remains essentially as it was on completion almost 800 years ago.